When Mike Brown was a kid, he had 4 older brothers who were always going to the store to pick up sports cards for their collections, mostly baseball. His dad was also an avid sports fan and was a big Pirates fan. He passed down all of his Pirates cards like Clemente and Stargell to the kids and it helped spark the fire to collect. Mike remembers going in to Woolworths when he was about 6-years-old with his brother to pick up 1976 Topps rack packs trying to find Pete Rose and Nolan Ryan. 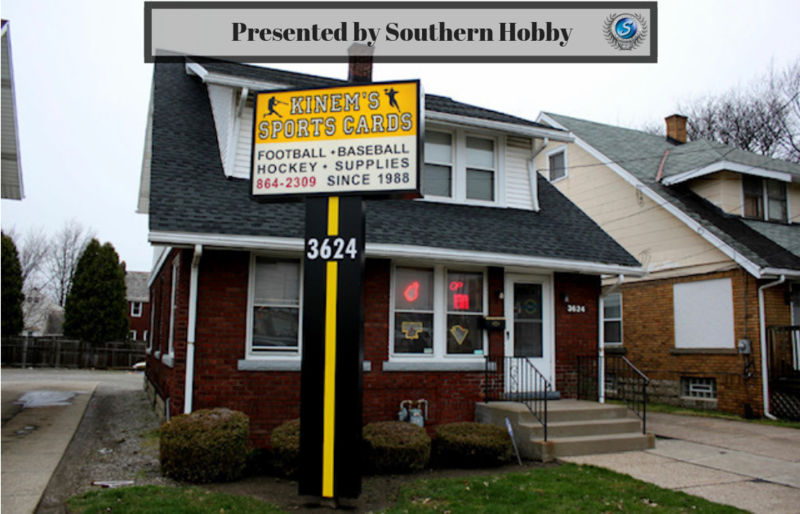 Forty-two years later, Mike is the owner of Kinem’s Sports Cards in Erie, PA, still living the Hobby he enjoyed as a kid. I recently caught up with Mike to discuss the Hobby in PA and how Kinem’s has been going strong for 30 years. JS – Thanks for taking the time to talk with us Mike. You have been in the card business since 1996 when you joined Kinem’s, which opened in 1988. Can you tell us what led to a career in sports cards? MB – The previous owner of the store hired me in 1996 to manage the store. I met the owner at a card show at the Downtown Holiday Inn and he gave me a business card. I started coming in to the shop to hang out. He knew I was knowledgeable from my many years of collecting and he asked me to help him with the occasional sales he would have. I got acclimated to the products and the customers during this time but was still just a collector. As time went on, I worked more and more and he decided that he was going to go in a different direction for his own employment so he asked me if I wanted to buy the store. Owning a card shop had always been a dream for me so I purchased it in 2001 and that’s how I got into Kinem’s. I’ve been going strong ever since. JS – The Hobby has clearly gone through some ups and downs since you started collecting and even since you bought the store. We’ve been through the “Junk Wax Era”, which I use as a term of endearment because that is the year I started collecting myself. The industry hit some bumps in the late 90’s but has made a fierce comeback in the last few years. Can you talk those peaks and valleys as a shop owner? MB –I remember the first rack pack I opened when I pulled the Pete Rose with the sunglasses up. I remember the Johnny Bench from then, too. Those are really some of my first memories of cards. There have been some ups and downs since then for sure. The late ’80s and early ’90s were hot with new products like Pro Set, Score, Upper Deck, Stadium Club, and others. Then there was a lull around ’96-’97. Those were two of the slowest years, but things picked back up in 1998. The football rookie class was really good with Peyton Manning, Randy Moss, and Hines Ward. But what really helped things take off was the home run race between Mark McGwire and Sammy Sosa. That brought back a lot of fans that had soured during the strike of ’94. It took a few years, but that really brought things back with the whole world watching the home run race. I remember the McGwire Olympic Card being really popular and people building the Topps “Chasing History” set. It’s really grown from there. We have a good customer base and that is very important when running a small business, no matter what kind of business it is. We have some customers come in 2-3 times and week and some that come in once a month. It’s always been pretty steady and we have been fortunate in that. We are direct with Topps, Panini, Upper Deck and others and that always has helped with costs. JS – Kinem’s just celebrated their 30 year anniversary in September. Can you tell us about that event? MB – We had a three day event (Thursday-Saturday) that included giveaways, drawings, and sales on all items in the store. We marked supplies down 20% and made sure we had a ton of boxes in for the event. We brought a lot of people in for that. I remember talking with a couple of friends from Steel City and Blowout and they were very complimentary on us being open for 30 years while having to compete with online buying and selling. JS – As it relates to Erie, PA, you are in somewhat of a geographical triangle between Pittsburgh, Cleveland and Buffalo. Is your collector base full blooded PA or do you have a mixture of fans that come in the shop? Would you say any one team is more popular than the others? MB – We are about 90-100 miles from each of them. In regards to football, I would say that we are 50% Steelers, 30% Browns, and 20% Bills. We have a good mix, but mostly Steelers. Basketball’s popularity dropped off the first time LeBron left for Miami, but it bounced back when he returned. It has stayed popular thanks to the last few rookie classes. As far as hockey, we have the Penguins and Sabres but I would say 80% Penguins. As for baseball, it’s about a 70/30 split with the Indians and Pirates. JS – I do see that there is a healthy list of minor league teams in your area. Do any of those teams stick out with your collectors? MB – Minor league teams are pretty popular. We have the Erie Bayhawks, an affiliate of the Atlanta Hawks. Our most popular team is the Erie Otters, the minor league hockey team that had Connor McDavid for a few years. If you look at the NHL, we had McDavid, Connor Brown, Alex Debrincat, and other players that visited like Mitch Marner and Patrick Kane. There has been a lot of good talent come through. Connor McDavid being in town for 3 years and having customers just see him out in public was really fun. JS – Let’s talk hockey for a moment. I see some videos and discussion on your Facebook page about the sport and we don’t get too many stores that sell a lot of Hockey products. Does it sell well in your area? Because it is a smaller part of the market share, do you see a different level of passion in that sport among collectors? MB – I think we definitely have a good hockey base. I would say that football is #1 at about 40%, baseball at 30%, but hockey is strong at 20%. The fans that I have come in regularly when I have new products. I usually have 10-12 come right in to buy boxes when they release. So while there aren’t as many, I would say they are really passionate. I still go to some Otters games occasionally, but I went to almost all of them, including the playoffs, when McDavid was here. I went with a friend once and ran into a bunch of my collectors that all spoke to me and my friend said it felt like walking around with the mayor. It was really fun because I saw a lot of my collectors and we were all there to see McDavid play. I sold just as much hockey that year as I did any other sport. JS – Your Facebook page advertises dates for card shows throughout the year. Are these card shows that you sponsor? Can you tell us about those? MB – We just had one this past Sunday. It’s a smaller show with 30-35 tables. There are mostly local dealers but we do have some from out of town like Cleveland and Buffalo. There are about 20 dealers, with 15 or so local. We have cards, Starting Lineups, and other memorabilia. Of the 20 dealers, about 15 are new products with the others being 80’s and vintage. It’s a nice little show and we usually see over 100 people come through during the day, which is pretty good for a one day show. JS – You began collecting as a kid in the mid 70s. The changes over the last 45 years have been pretty obvious for you but (1) what do you see today that you never thought we would see and (2) what is the Hobby missing today that collectors would have enjoyed from the 70s and 80s? MB – I would say that autographs, and some memorabilia, were foreseeable on some level. But some of the stranger things like Goodwin Champions and Allen & Ginter with dinosaur teeth and Abraham Lincoln’s hair are items I never thought we would see. On the other end of autographs, I never thought we would see cut signatures of Babe Ruth, Ty Cobb, or Roberto Clemente. I never imagined that and I think the idea is pretty ingenious. As for what I miss, and this goes for some of my collectors as well, a lot of people ask what happened to the gum. Many people used to buy the packs just for the gum and gave the cards to their kids or nephews. And I really miss the smell of the old cardboard too. I would love to go back in time and open a pack of ’52-’53 Topps for the experience. Growing up, we still had the gum and the cardboard smell. That’s what I miss the most. JS – When considering products overall, what sets have been the most popular in your store? What do you base that popularity on? What are you looking forward to on release for the remainder of 2018? MB – For football, the early products like Elite are very popular. Collectors like collecting players when they first start appearing in sets. We are close to Penn State so Saquon Barkley has been very popular. I also sold a lot of Certified this year. For baseball, it is always Bowman. The time of year it is released is perfect because collectors are excited about the start of the season. I have a few boxes of Bowman now, but I went through my initial allocation months ago. All of the Bowman products are hot. 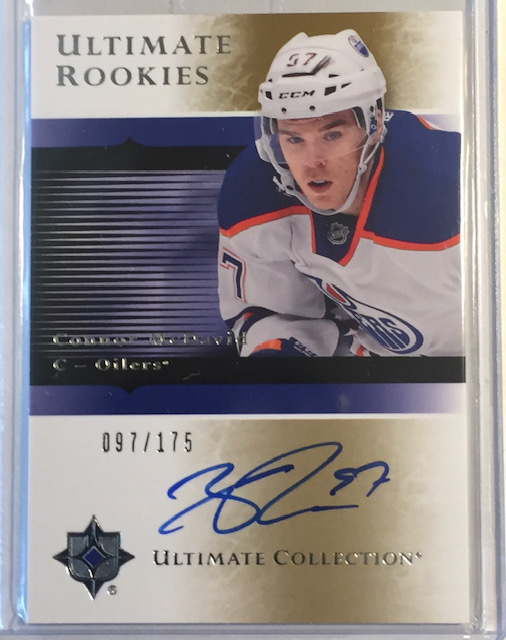 Hockey is not as hot as it was with McDavid and Mathews as rookies but SP Authentic is usually hard to keep in stock. For basketball, it’s the high end stuff like Opulence, National Treasures, Impeccable, Immaculate and products like that. The high end autos you can pull from those products are very exciting for collectors. I actually just found out that Charles Barkley is in Immaculate this year! JS – I found some great pulls on your Facebook page. Can you tell us about some of the bigger hits that have been pulled at your store over the last 30 years? MB – Probably the coolest in my opinion was Archives Signatures in 2016. Someone pulled an actual Hank Aaron Autographed Rookie Card and it was a 1/1. It wasn’t beat up either and would probably grade a 4 or 5. We also had a pull from Bowman Chrome that was a redemption for the Mike Trout/Kris Bryant Super Refractor. 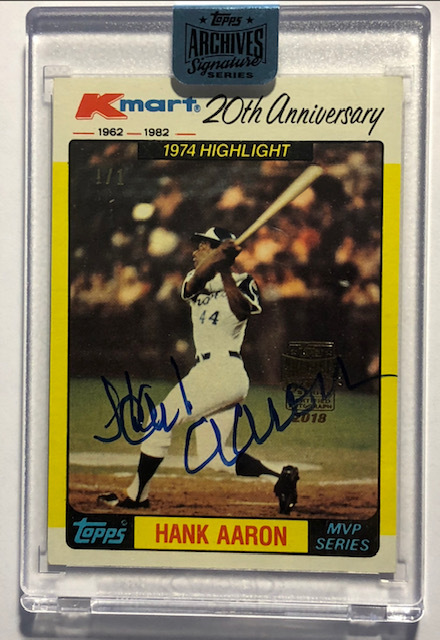 In this year’s Archives, we had someone pull a Hank Aaron 1/1 1982 KMart Auto. Our direct cases for Archives Signatures have done really well. Our first case had seven 1/1’s! We have had Aaron, Winfield, Rickey Henderson, and Darryl Strawberry. Probably the best card ever pulled here was the SP Authentic Lebron/Michael Jordan autograph numbered 19/23 in Lebron’s rookie year. We also had a Gold parallel auto of Lebron numbered to 50 in Authentic that year. JS – On the subject of Facebook, I see you are pretty active on social media. How much has it changed the way you advertise and how important do you find social media to be in your efforts for success in 2018? MB – Facebook is a really good tool for advertising. I advertise my card shows, boost the post, and then share it across the platform. Social media is quite helpful with advertising, getting products out there, and advertising shows. Before that, we had to go through newspapers. Now that everyone is on their phones, we can send out alerts and stay on our collectors minds. Facebook helps a lot, but I’m on Twitter and Instagram as well. Social media is a big help. JS – How do you feel about the relationship between card companies and shop owners at this time? Your shop was around when there were multiple companies like Fleer, Score, Upper Deck, Donruss, and Topps in the major sports? Has the downsizing of the companies (but not number of products) had an effect on the shop owners? MB – I think the relationship is good. I wish they would give us a little more allocation of products but we also have distributors like GTS we can get them from. A lot of that is due to the number of breakers now, which is good and bad. There are more mouths to feed and the companies have to keep people happy. I understand that, but a lot of people on the outside looking in feel like shop owners should be more upset because we have been around for years and our allocation is being broken up for the breakers. But I do see what the companies have to contend with. I understand it is a case of weighing whether they want to ship out 1 case to 20 card stores or 20 cases to one buyer. It‘s a tough situation but they take good care of me. I get every product and my allocation is ok.
MB – One of the biggest complaints I get is in regards to the Panini Points system. When a box advertises 2 autographs and 1 memorabilia but one of the autographs is 150 points, it is kind of depressing for collectors. Points should be in addition to the stated hits, kind of like a bonus. You have to go online, pay shipping, and all of that. I don’t see as many redemptions as I used to, but there are still enough out there. I’ve had some for years that I’m waiting on. I have some collectors who went in and just got different cards, which is a nice part of the program. No Topps Chrome Football has to be the biggest complaint I hear. I know there is Prizm, which is comparable, but it isn’t the same. If they brought Topps Chrome back, I would sell 15-20 cases of that. I used to tell my wife when the product came out to not expect me until after 8; and I closed at 6. We had a lot of customers come in and want to open in store. 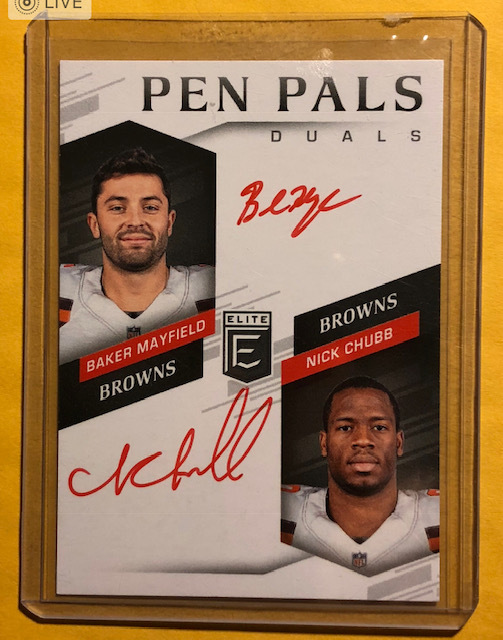 Panini has a lot of great products like Contenders, but I do wish Topps could make some of the football products they used to make, even if just base Topps, Chrome, and Triple Threads. 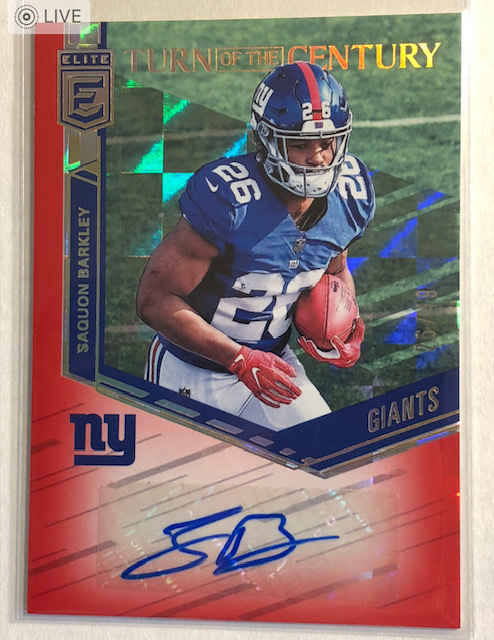 It would be nice if Topps and Panini could come to an agreement on a small amount of cross products in Baseball and Football. I think Basketball and Hockey are good with one company. Maybe that will happen one day but we will just have to see. MB – The next two card shows are scheduled for December 2, 2018 and January 27, 2019. Also, Black Friday is a crazy day here. I did something different last year. I usually open at 8 but I opened at 6 last year and offered special prices from 6-8 and had people standing outside waiting on me to open. I had about 30 customers from 6-8. Black Friday is always a fun day.